Between my travel and my husband’s travel it seems as though we’ve been passing ships in the night lately. So, of course I jumped at the chance of having a date night with him before his next trip. We have certainly gotten settled in our ways over time. We have our favorite restaurant and our favorite bar and it’s rare that we venture out further than that. This past weekend we decided to do something a little different. 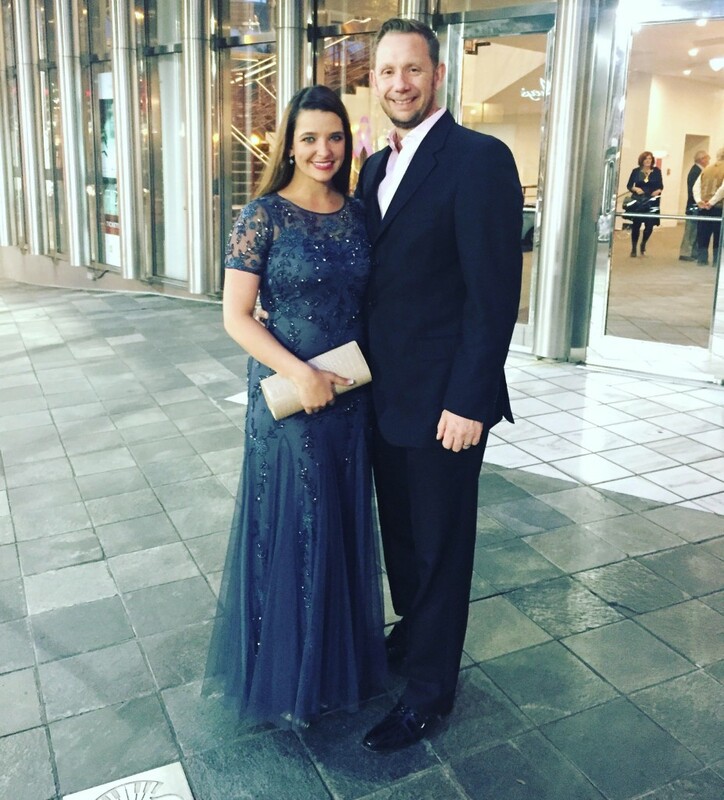 We had a date night at the Opera! I happen to love going to the Opera. I find myself lost in the beauty of the talent vs the translation. However, this was my husband’s first time going and he was certainly unsure of how the night would unfold. We went to see FIDELIO at Opera Carolina. This German Opera was Beethoven’s one and only. We began our night at Blue where we enjoyed wine and appetizers with a few other’s attending the Opera. Then we headed straight to the Red Carpet. Opera Carolina pulled all strings to make opening night a memorable one. It’s not every day you are able to get dressed in your best and are able to walk a red carpet. Left to Right: Jennifer Malone, Ally Frazier, Me, Garbage Gone Glam Model, Garbage Gone Glam designer Kristen Alyce, Brie Wright, and Katie Levans. 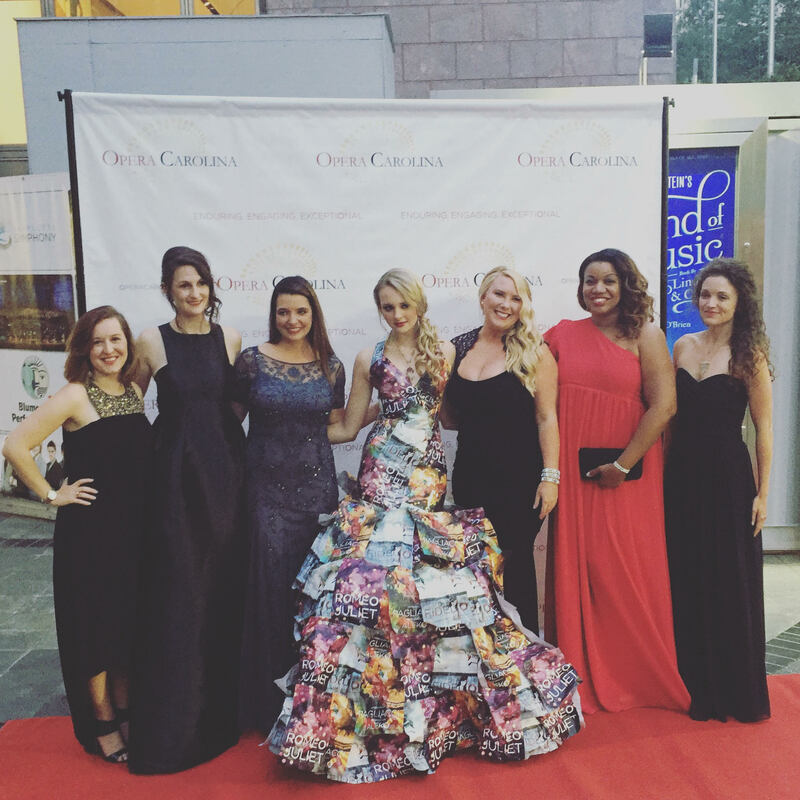 This year Opera Carolina partnered with Garbage Gone Glam to create a one-of-a-kind dress out of programs and posters from the 2015-2016 season. This couture gown, created by Kristen Alyce, was made completely of recycled materials. 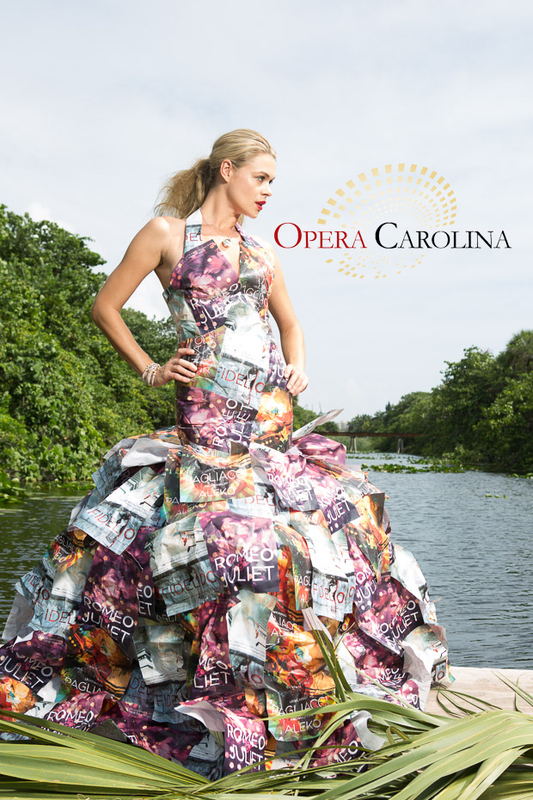 The dress consists of 150 Opera Carolina Posters, 20 Target plastic bags, bubble wrap, and packing tape. The dress will be displayed during opening night of each show during the 2015-2016 season. We had an incredible night. And while my husband said he had a little bit of trouble following along…he’d go back again. So, that’s a win! FIDELIO will run again October 22nd and October 25th. Personally, I can’t wait until Romeo and Juliet in January of 2016. So tell me. What is your idea of a UNIQUE date night? The fact that Fidelio is the great Beethoven’s only opera is unique enough. How do you make it even more fresh and meaningful? By setting it behind the Berlin Wall in the days leading up to its ultimate fall in 1989. Fidelio is a rousing tale of undying love, a love that not only glimmers through the darkness of oppression, but one that radiates once liberated. You and your hubby looked amazing! I’m obsessed with the opera.